The centerpiece of The Creek at Dominguez Hills is its one-story, 50-foot-high, 199,000-square-foot multi-use indoor sports complex, designed with maximum interior adjustability to accommodate an array of sports and special events—from athletic practices and team competitions by local sports groups to community uses and daily sports and fitness programming. 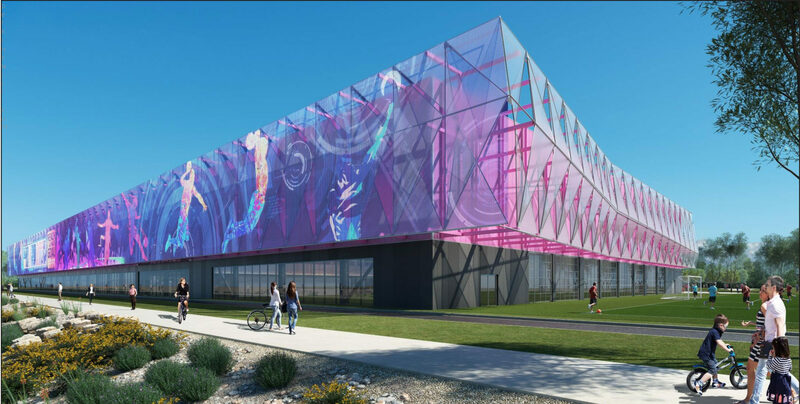 The sports complex will be a premiere venue for regional and local amateur athletic tournaments, weekday and weeknight team practices, adult and youth sports leagues, corporate sports leagues for local and regional businesses and private sports and fitness training. In addition, specific areas within the multi-use complex will be suitable for children’s birthdays and general play areas. A 66,000-square-foot flexible court configuration to accommodate 8 to 12 sports courts for basketball, volleyball and badminton. Two 14,000-square-foot synthetic turf fields to be configured as batting cages and pitching tunnels for boys’ baseball and girls’ softball practice and training. A sports performance area, including a sprint track and specialized training area for youth and elite athletes, measuring a total of approximately 2,500 square feet. A 14,000-square-foot “Kids Zone” providing a play area with a rope-climbing course, laser tag and redemption arcade. A 2,500-square-foot café area providing food and beverage service for children, youth, adults and families (between daytime games and on weeknights and weekends). An estimated 18,000 square feet of ancillary and administrative space will accommodate the sports complex’s lobby, offices, kitchen, restrooms, locker rooms and team and referee rooms. Sign up to get the latest updates sent right to your inbox!